Sprint Schedules October 7th Event, Announcing a Sprint iPhone? Sprint has scheduled an event for October 7th. The event is labeled as a “Strategy Update;” however, given its proximity to the rumored iPhone 5 launch, many are speculating that part of Sprint’s new “strategy” will involve the launch of the newest iPhone on the network. If there’s no iPhone announcement (and even if there is) Sprint is also likely to discuss its 4G plans for the future at the event, definitely a hot topic for current and prospective Sprint customers. Rumors that Sprint might be carrying the iPhone 5 started last week with a Wall Street Journal article claiming the handset would be branching out beyond Verizon and AT&T. Apple has yet to announce the iPhone 5, and Sprint has advised its employees to make “no comment” on whether the phone will be available on the network. What do you think? 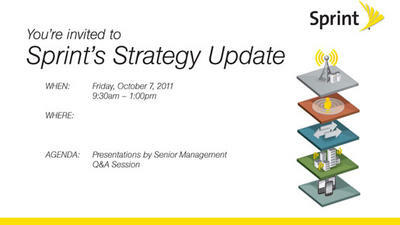 Will Sprint announce it will be carrying the iPhone 5 on October 7th? If not, what do you think Sprint will discuss at the event?